After a long, hot summer, anglers in the northeast welcome the cooling temperatures of the fall. The weather becomes more comfortable and the cooling water temps bring bait and game fish closer to the shorelines. And with these seasonal changes also arrives the false albacore. 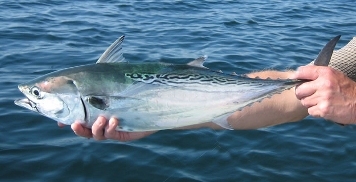 False albacore, or little tunny, are closely related to tunas and mackerels. Their appearance causes them to commonly be misidentified as small tuna or Atlantic bonito. The worm-like lines down their backs and the absence of teeth help discern them from other fish. They begin to invade the shallower coastline waters as they start their migration south for the winter. These fish are highly migratory, ranging from Massachusetts to Florida throughout different times of the year. They travel in schools, intercepting pods of bait fish and commonly push them to the surface where they slash their way through the school with tuna-like speed, decimating the baitfish in short order. They are also a food source for larger game fish such as sharks and marlin. Their appeal to anglers comes from their fighting ability. 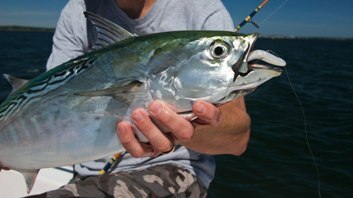 Because of their physical resemblance to tuna, they fight just as hard as their larger cousins which make them a welcome arrival to inshore fishermen. They are notorious for their ability to strip all the line from the reel of unprepared anglers with their blistering and unrelenting hyper-speed runs. Once they are brought closer to the boat they fight in circles below the boat much like tuna. Their average size ranges from 5 – 10 pounds with bruiser size fish reaching the mid-teens. Unfortunately, they do not make for good table fare. Rumors indicate that even those of the feline persuasion will turn their nose at a false albacore. The easiest way to locate these fish is by looking for schools of fish breaking the surface in pursuit of bait fish. These schools of feeding fish are often times given away from a distance by packs of sea gulls that are feeding on the same schools of bait. When fish are located take note of the specific area as these fish will routinely use the same areas to feed. More than likely, you’ll find these fish in areas of faster moving water that funnels and disorients the bait fish moving through. Likely areas would be both natural and artificial reefs, between islands and around large rock piles. When revisiting these areas in the future it is often times worth blind casting the area even if you do not find fish feeding on the surface. The fish will usually remain in the area until the bait population is depleted or has moved on. False Albacore can be caught on swim baits, jigs, spoons, or like this one, with a soft plastic jerk bait. Beaches and other shoreline locations will also attract false albacore. They will often times be found feeding alongside striped bass, bluefish and other predators right off the beaches and within casting range. The most common style of lure to throw for these speedsters is a small, shiny metal spoon. They usually prey upon smaller bait like silversides, peanut bunker and anchovies which are easily replicated with spoons in the 1-2 ounce size. They will also respond well to small swimmers, soft plastics and top water plugs. Keep an eye out the next time you are cruising in your boat to your next fishing location. The fish breaking under those diving gulls off in the distance may not be just another school of 3 pound bluefish. They may just be false albacore!